Harvey Eskew and H. Vanhooser left Monday for a trip in the west. Wankenee, I. T. being their destination. Source: Crittenden Press. (Marion, Ky.) 1879-1907, February 1, 1906, Image 5 - Chronicling America - The Library of Congress. Source: Crittenden Record. (Marion, Ky.) 1904-1907, February 2, 1906, Image 4 - Chronicling America - The Library of Congress. The Adams and Pierce Machine Shop has been sold to M. O., J. C. and A. J. [A. P.] Eskew, who will conduct the business at the old stand under the firm name of Eskew Bros. 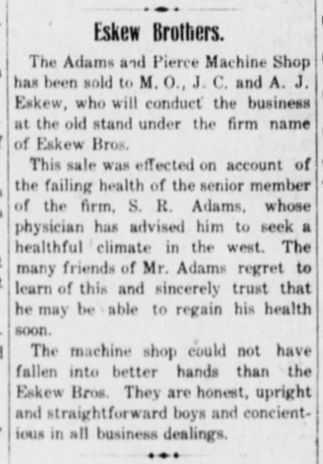 This sale was effected on account of the failing health of the senior member of the firm, S. R. Adams, whose physician has advised him to seek a healthful climate in the west. The many friends of Mr. Adams regret to learn of this and sincerely trust that he may be able to regain his health soon. 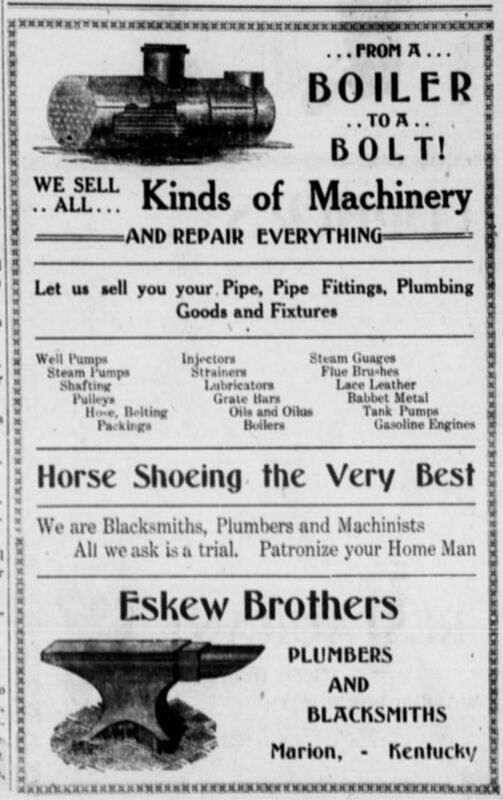 The machine shop could not have fallen into better hands than the Eskew Bros. They are honest, upright and straightforward boys and concientious [sic] in all business dealings. Source: Crittenden Record. (Marion, Ky.) 1904-1907, February 2, 1906, Image 5 - Chronicling America - The Library of Congress. Harvey Eskew and Henry Vanhooser have gone to Wankenee, I. T.
Harvy [sic] Eskew arrived home some time ago from Indian Territory. Source: Crittenden Record. (Marion, Ky.) 1904-1907, March 16, 1906, Image 8 - Chronicling America - The Library of Congress. Motion of A. J. Eskew for iron bridge on Piney creek at Porter's Mill ford. Source: Crittenden Record. (Marion, Ky.) 1904-1907, April 12, 1906, Image 1 - Chronicling America - The Library of Congress. All kinds of carriage painting done at Eskew Bros.' shop by a first-class painter. Give us a trial. Source: Crittenden Press. (Marion, Ky.) 1879-1907, May 3, 1906, Image 1 - Chronicling America - The Library of Congress. All rubber tire work guaranteed by Eskew Bros.
Go to Eskew Bros. to have your rubber tire work done. 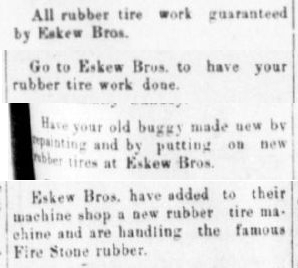 Have your old buggy made new by repainting and by putting on new rubber tires at Eskew Bros.
Eskew Bros. have added to their machine shop a new rubber tire machine and are handling the famous Fire Stone rubber. Source: Crittenden Press. (Marion, Ky.) 1879-1907, August 17, 1905 [June 7, 1906], Image 6 - Chronicling America - The Library of Congress. Gasoline retails at Eskew Brothers shop at wholesale price. The Myers force and lift pump for sale at Eskew Brothers. Satisfaction guaranteed. 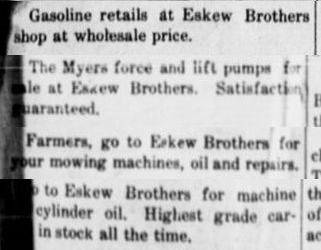 Farmers, go to Eskew Brothers for your mowing machines, oil and repairs. Go to Eskew Brothers for machine and cylinder oil. Highest grade carried in stock at all time. Source: Crittenden Record. (Marion, Ky.) 1904-1907, July 13, 1906, Image 4 - Chronicling America - The Library of Congress. A. J. Eskew and wife attended the graveyard cleaning near Hoods, Saturday. Andrew Eskew, of Marion, visited his father Sunday. Source: Crittenden Press. (Marion, Ky.) 1879-1907, August 3, 1906, Image 14 - Chronicling America - The Library of Congress. 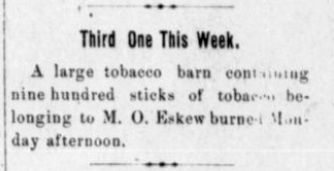 A large tobacco barn containing nine hundred sticks of tobacco belonging to M. O. Eskew burned Monday afternoon. Source: Crittenden Press. (Marion, Ky.) 1879-1907, September 20, 1906, Image 1 - Chronicling America - The Library of Congress. Joe Dean was in the city Tuesday and brought the news of the burning of M. O. Eskew's barn. Source: Crittenden Press. (Marion, Ky.) 1879-1907, September 20, 1906, Image 5 - Chronicling America - The Library of Congress. Any one interested in Piping or Plumbing--See Eskew Brothers, Adams old stand. Source: Crittenden Record. (Marion, Ky.) 1904-1907, October 5, 1906, Image 8 - Chronicling America - The Library of Congress. M. O. Eskew, of the firm of Eskew Bros., will move his family to town in a few weeks. Source: Crittenden Record. (Marion, Ky.) 1904-1907, November 2, 1906, Image 5 - Chronicling America - The Library of Congress. 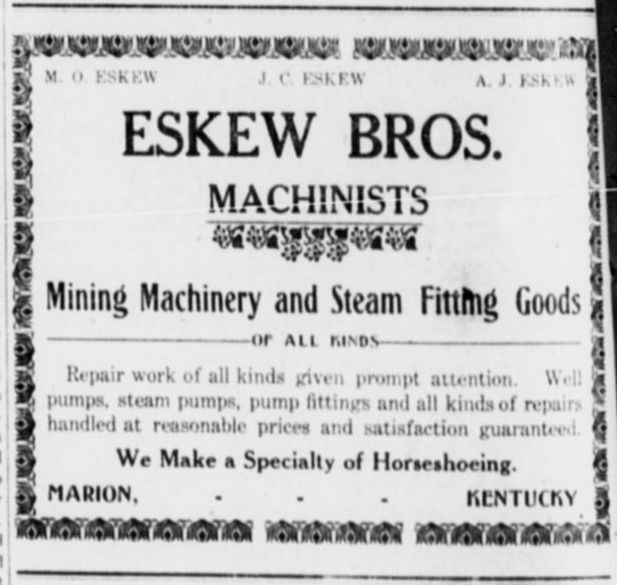 The Eskew Brothers, machanists [sic], plumbers and horseshoers, have lately abbreviated their name and now they are addressed S. Q. Bros., Marion, Ky. This does not prevent their getting mail. Source: Crittenden Record. (Marion, Ky.) 1904-1907, November 16, 1906, Image 4 - Chronicling America - The Library of Congress. 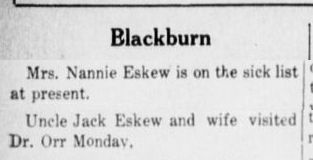 Mrs. Nannie Eskew is on the sick list at present. Uncle Jack Eskew and wife visited Dr. Orr Monday. Source: Crittenden Press. (Marion, Ky.) 1879-1907, November 23, 1906, Image 8 - Chronicling America - The Library of Congress. Andrew Eskew, of Marion, was here Thursday. Jno. Eskew and family visited his father Sunday. Source: Crittenden Press. (Marion, Ky.) 1879-1907, December 7, 1906, Image 8 - Chronicling America - The Library of Congress. 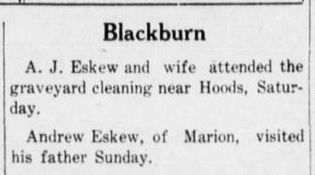 Mrs. Nannie Eskew is still on the sick list. Source: Crittenden Press. (Marion, Ky.) 1879-1907, December 21, 1906, Image 4 - Chronicling America - The Library of Congress.